After carting back to San Francisco a 26 lb. turkey carcass from our Thanksgiving dinner with family in New York City, I warned my husband that I would not let one bit of it go to waste and would take him on a "Turkey Culinary Tour Around the World", making use of the turkey meat in non-traditional recipes and making stock for soup with the bones. Our first stop on the culinary tour was a spicy Turkey Tetrazini, picking up a recipe from the Net, and then on to Mexican Stuffed Pasilla Peppers (stuffed with sliced turkey, a soft Mexican cheese and cilantro) served with a cilantro-flavored tomato sauce. Our final stop was in the Orient, with an adaptation of a classic Chinese dim sum recipe for "Curry Puffs". We served the curry puffs (I call them turnovers) with a celery root bisque (made with turkey stock). Both recipes are perfect for a post-Thanksgiving Sunday Supper and they are also a great way to use up any leftover celery ribs (for the stock and bisque) and mashed potatoes (for the curry turnovers). in the dough as it bakes. Peel and coarsely chop one onion and one celery rib for every 5 lbs. of well-picked over turkey bones. Put them in a large stock pot along with the bones and 2 bay leaves for each 5 lbs. of bones. Add enough water to barely cover the bones. Cover the stock pot with a lid and bring to a boil, then the reduce heat to simmer and cook for 5-6 hours. Remove all the solids and refrigerate the stock overnight. The next day skim off the layer of fat that has collected on the surface. Set aside 3 - 4 cups of stock for the celery root bisque and freeze the remainder. Peel a 1� lb. celery root bulb and cut it into 1" cubes. Peel and coarsely chop one yellow onion and 3 ribs of fresh celery. Place the celery root, celery ribs and onions in a large pot and add 3 cups of turkey stock. Cover and bring to a simmer. Cook over low heat about 30 minutes or until the celery root is very tender. Puree all ingredients (including the liquid) in a Mouli food mill. Add more stock as needed to get the consistency of a bisque. In a food processor, place 1 � cups flour and 2/3 cup Crisco, crumbled into marble-size pieces. Process until the mixture resembles coarse corn meal. Add � cup of ice water by the tablespoon and pulse a few times after each addition, being careful not to over process the dough. If the dough looks like it is getting too moist, don't add the rest of the water. Remove the dough from the processor bowl and bring it together into a ball. Flatten the ball and wrap it in waxed paper. Put it into the refrigerator for at least 30 minutes or until ready to use. Coarsely chop about 2 cups of turkey meat either by hand or using a quick pulse in the food processor. Be careful not to over process it. Peel one medium-size yellow onion, coarsely chop it and saut� in peanut oil until lightly golden brown. Add the chopped turkey to the onion, then add 1 - 2 TBS S & B Oriental Curry Powder (depending on your taste). Add � cup turkey stock. When the entire mixture is cool, add � cup cooked mashed potatoes or 2 tsp. cornstarch. Remove the dough from the refrigerator and cut in half. Roll each half into a log about 1 �" in diameter and about 8" long. Cut each log into 10 pieces. Flatten each piece into a circle and roll it out into a thin 3 � - 4 " circle. Seal the edge by lightly pressing with the tines of a fork. Brush each turnover with an egg wash (one egg beaten with 2 tsp. cold water). Freezing Stock: A great way to freeze large quantities of stock is to put them into sandwich-size Ziploc lock bags. This is easily done by nesting the open bag upright in a 2-cup glass measuring cup and ladling in the cold liquid. The only trick is to remove all the air from the bag as you zip it closed and to make sure that the bag is tightly sealed. Carefully stack the filled bags on a flat tray and freeze. Remove the bags from the tray when frozen and stack them in the freezer. This is a space-saving way to storage large quantities of any liquids. Mouli Food Mill: To me, this simple, manual tool is indispensable for pureeing cooked vegetables. It usually comes with three interchangeable screens of varying fineness. The soft pulp is pushed through the screen and the fibrous part of the vegetable is left behind. You could also use a blender or food processor in this recipe, but neither will remove the strings of the celery ribs and fibrous parts of the celery root. Only the Mouli food mill will do this. 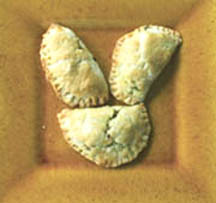 Processing the Dough: As water is incorporated into the dough, the glutens will begin to develop. The secret for making light and flaky dough is to process the dough as little as possible while incorporating the water. S & B Oriental Curry Powder: If S & B brand of Oriental Curry Powder is not available in your area and you plan to use traditional Indian Curry Powder, I suggest that you add it in small amounts and taste after each addition. S & B Oriental Curry Powder is much milder and sweeter than Indian Curry Powder, so you may not need 1-2 TBS as indicated in this recipe.